Adding on or building new? We can help you keep your livestock safe and secure. 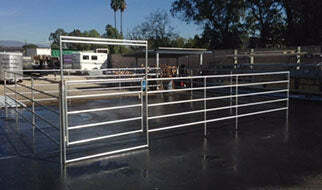 Our horse corral panels are heavy duty and are made with true 16 Gauge Gatorshield American made galvanized pipe. They hold up to the beating your horse can give them and are truly the best quality. Come and check us out! We have a fully stocked sales lot here at Rarin’ To Go Corrals. We fab the best panels in the industry at an economic price. 16'W x 6'H Corral Gate Panel 6-Rail 1-7/8"